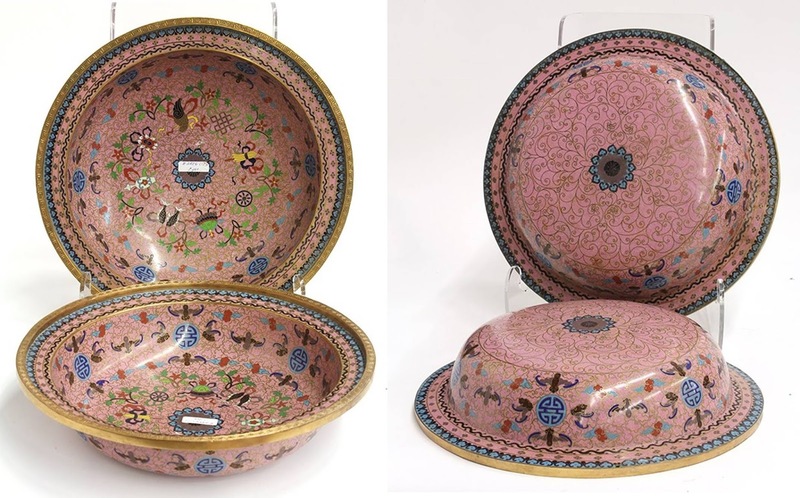 The prior post about an interesting plate with an unusual background of rose pink enamel prompted some further investigation, and the following observations. The method for producing pink glass relies upon two metals - gold and/or selenium. European glass technology had discovered the chemistry for creating the right type of gold compound by the 17th century. The powerful early Qing emperors employed visiting Jesuits from Europe to develop, among other things, the ability for the imperial workshops to produce this gold pink enamel first for porcelain and then cloisonne, especially during the 60-year 18th century reign of Emperor Qianlong. 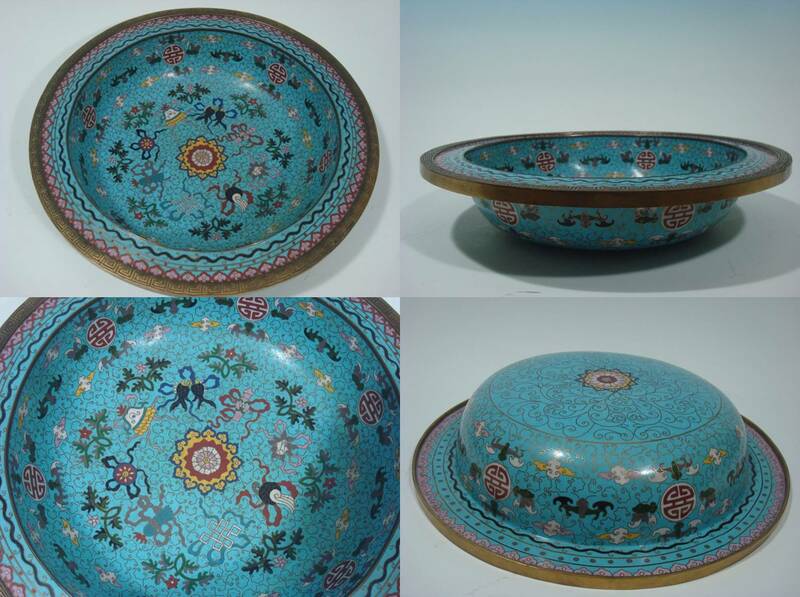 Chinese "Canton enamel" painted on a metal tray. 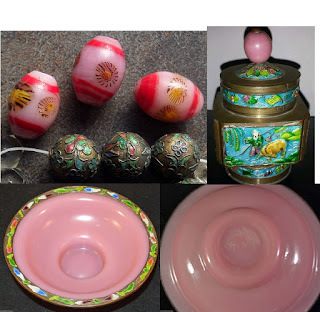 During the later half of the 19th century, improved chemistry resulted in the discovery that selenium could also be used to produce pink glass, as well as a bright, hot red in combination with cadmium. Selenium may be a comparatively rare and expensive element, but it is nonetheless cheaper than gold. 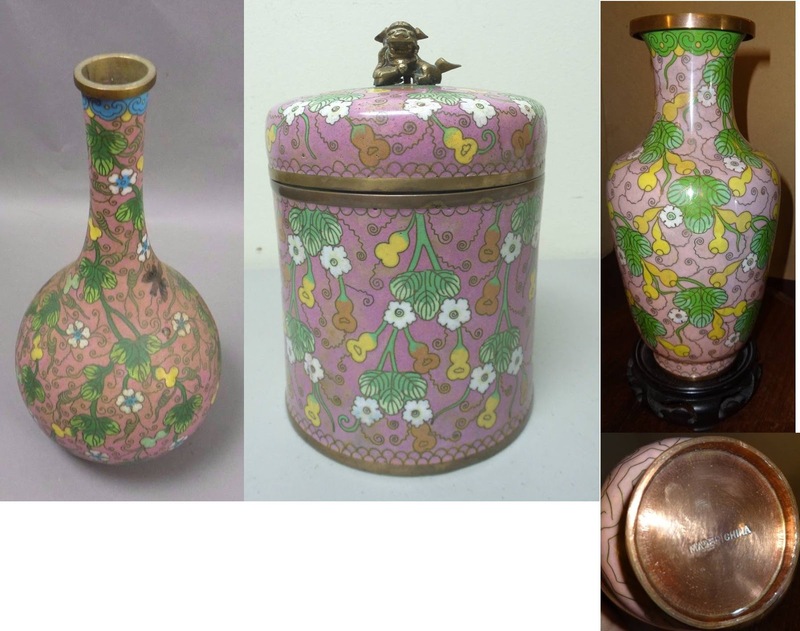 By the 1920s, glass industries worldwide had adopted selenium and cadmium technology for pink and red. (Here's an example, from a 1941 patent). 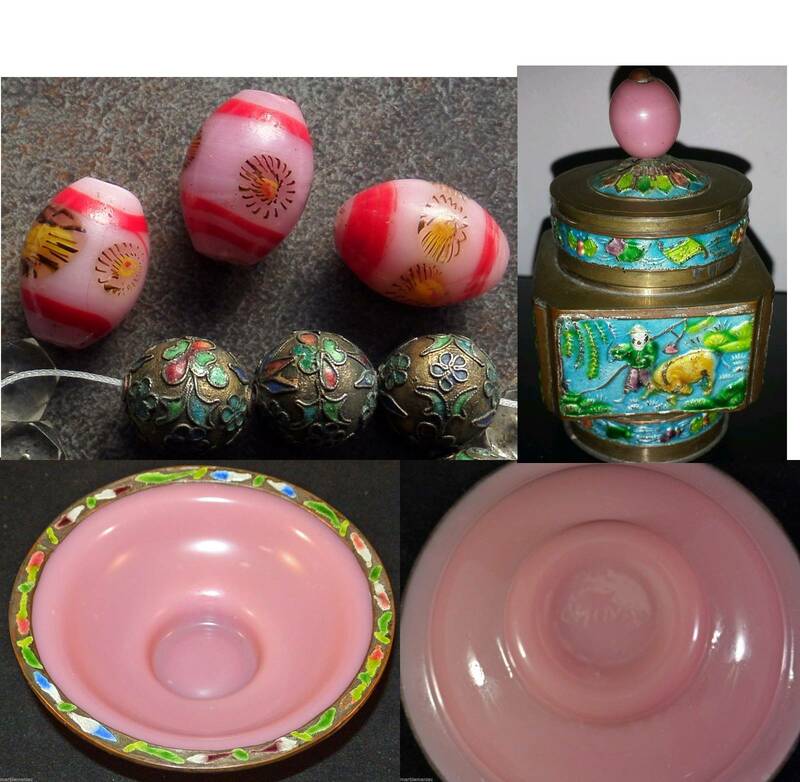 Chinese pink glass - Boshan beads, pink "Peking Glass" finial on an enameled brass souvenir canister, opal pink dish marked "CHINA" with enameled metal rim - all likely to be from circa 1910-1930s. 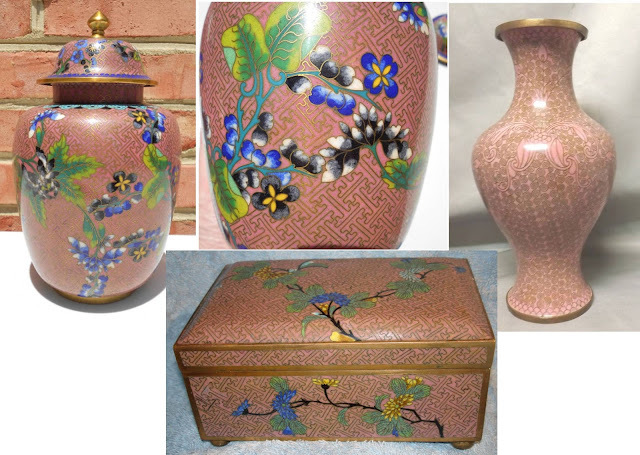 Japanese cloisonne ateliers during the "Golden Age" (1880-1910) developed new cloisonne enamel coloring technologies, working with German glass chemist Gottfried Wagener, who in 1884 headed the ceramic and glass engineering department of the Tokyo Arts and Crafts School. 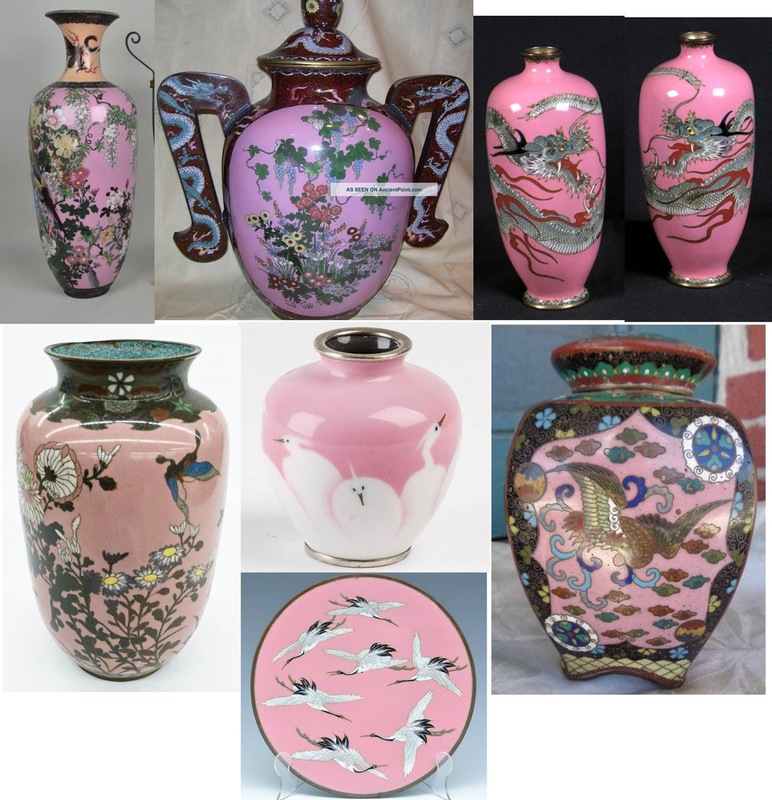 Japanese cloisonne examples with various pink backgrounds. Notice the absence of a background pattern in most of the pieces. 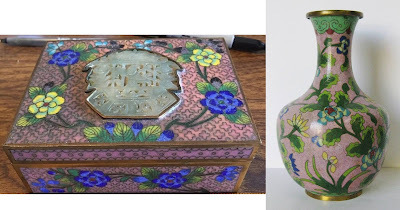 But what about Chinese cloisonne? Below is a sequence of examples displaying a pink enamel background, arranged in what is my best guess as to rough chronological order. 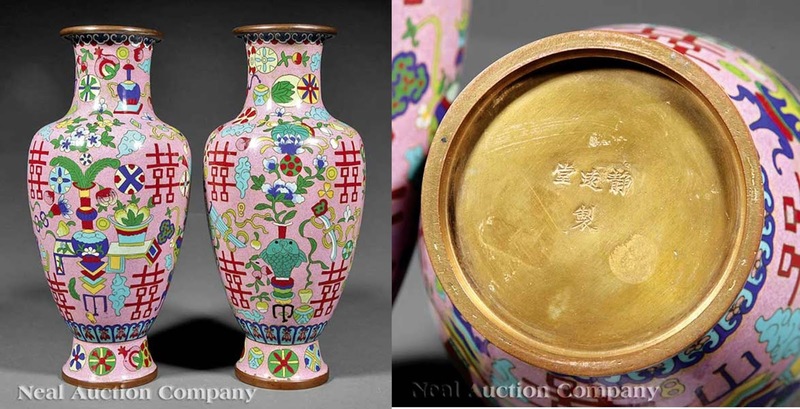 Online auctioneer believed this to be from the 18th century. 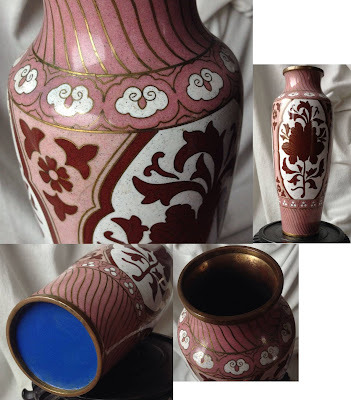 A moon flask with Wan background pattern, apparently at one time drilled to covert into an electric lamp. Base stamp reads "Jing Yuan Tang Made." 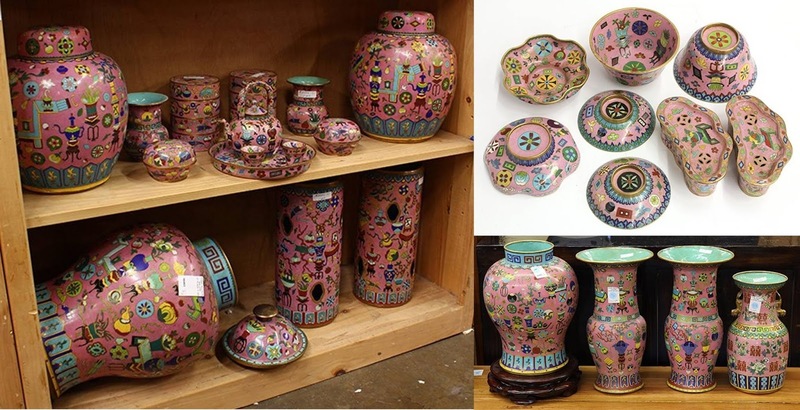 Online auction. Appears to be a set designed as a marriage gift, judging by the double fish and double happiness character motifs. Is this an instance of a bright pink selenium enamel, an effort to use modern glass technology? 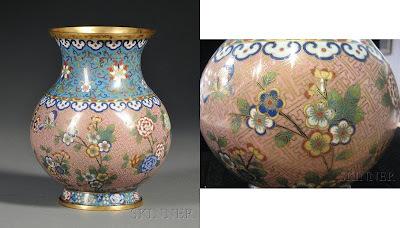 Could the enamel have been produced in Japan? Late in the Qing dynasty and during the Republic, the craft of enamel, like the last rays of a setting sun, again reached a minor peak. 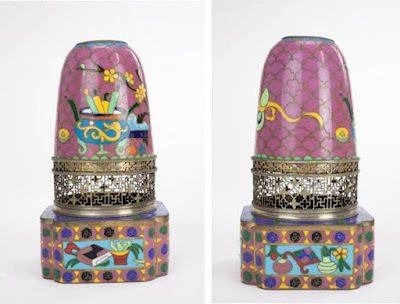 The finest surviving cloisonne objects from this period exhibit marks of official and private organizations and workshops, such as Yinzhuju xunzhang zhizaosuo (... The Factory of Engraving and Casting Decorations), Laotianli (老天利), Jingyuantang (静远堂), Zhiyuantang (志远堂), Baohuasheng (寶華生), Dexingcheng (德興成), and Decheng (德成). But owing to the lack of documents, very little is known about these enameling workshops during this period. 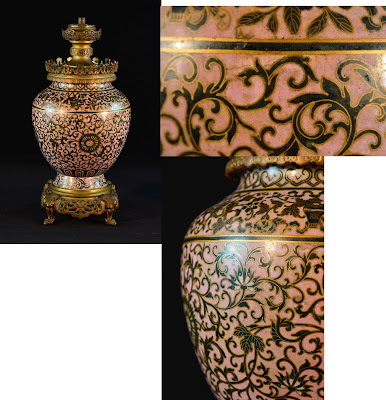 A jar in the "hundred treasures" motif. 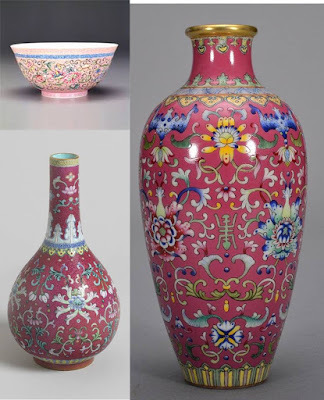 Note the similarity in the central motif to the Jingyuantang vase - the large decorated vase with peacock feathers (? ), atop a 3-legged table; behind, a table containing a bowl of peaches. 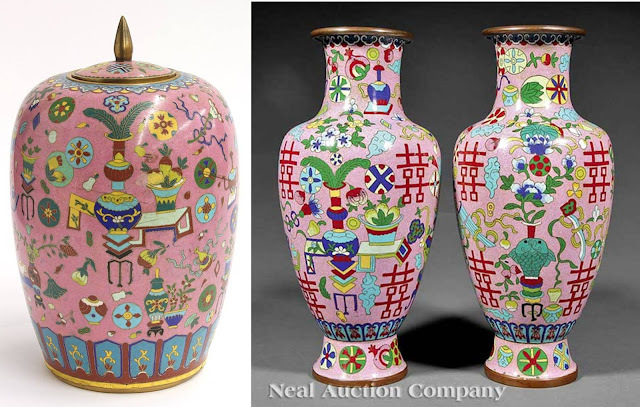 Also observe the more careful composition of the overall design in the vase pair, whereas the motifs on the jar seem to be scattered all over the place. 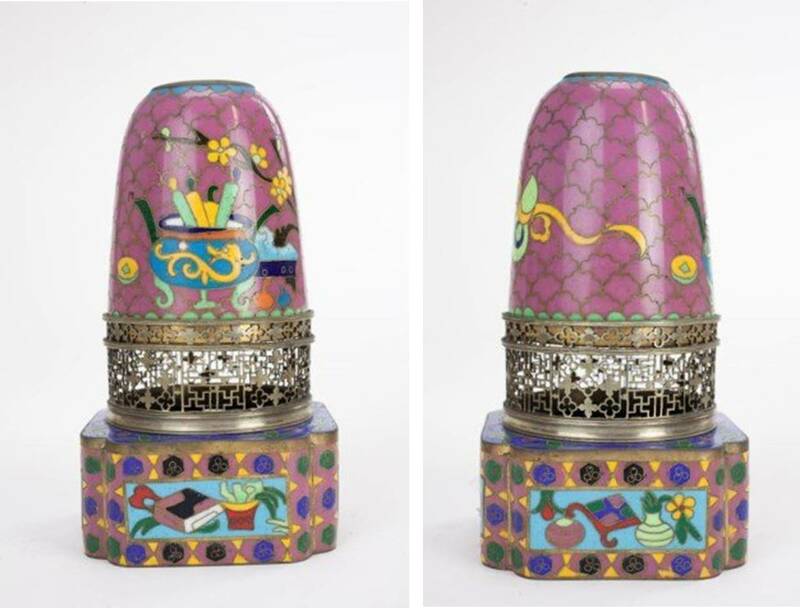 An unusual cloisonne foot on the jar, apparently a sort of cap crimped on over the bottom of the cylinder. The former collection of Edward Gerber seems to contain a large number of this style of pink cloisonne, many still in pairs. More on this in an upcoming post. This lotus petal pattern appears in other shapes, such as a vase or box. The "Made In China" stamp appears on pieces for export to the United States, in compliance with a 1920 tariff act revision. 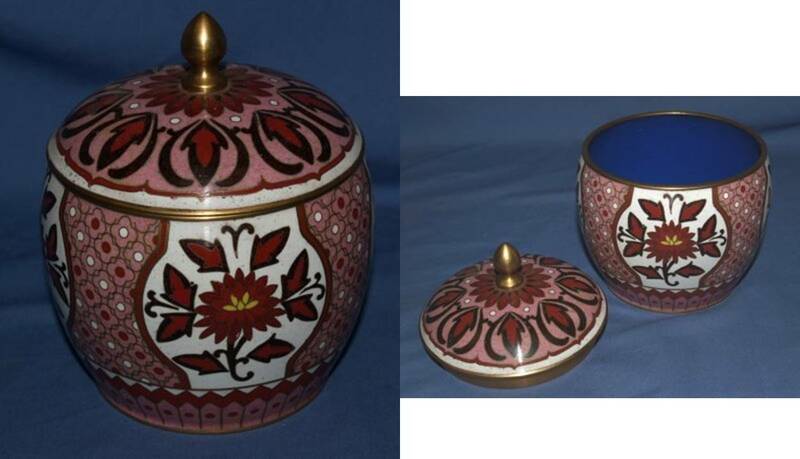 This elegant design seems very 1930s-40s, but I wonder if it is in fact from the government-sponsored cloisonne workshops of the early 1950s, when they were trying to modernize and revive the craft. 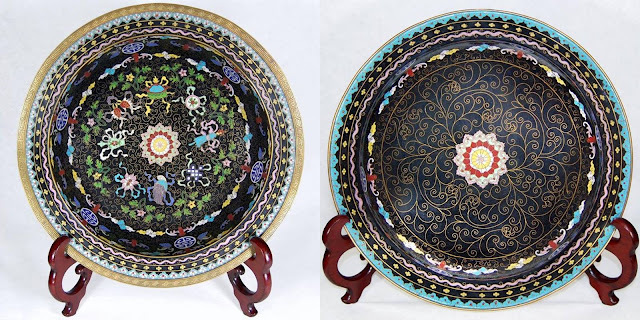 It's an unusual design of abstract Chinese motifs. Are the tonal variations in the pink the result of grinding and mixing varying proportions of white in with the deep maroon enamel? Another example with a turquoise background in the medallion. The "petal" diaper in this lamp, as well as the little gourd motif floating all by itself on the side opposite the main motif, matches other pieces that seem to date from the 1950s, before the start of the Cultural Revolution in 1966. 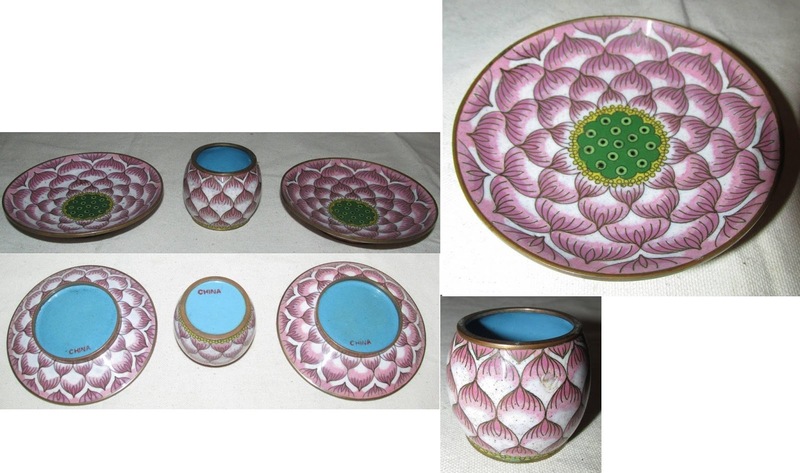 These melon boxes appear in various background colors other than pink, seem to be from the 1980s or later. Basins featuring an 8 Treasures motif, scrollwork on base. 1990s? Or 1890s? 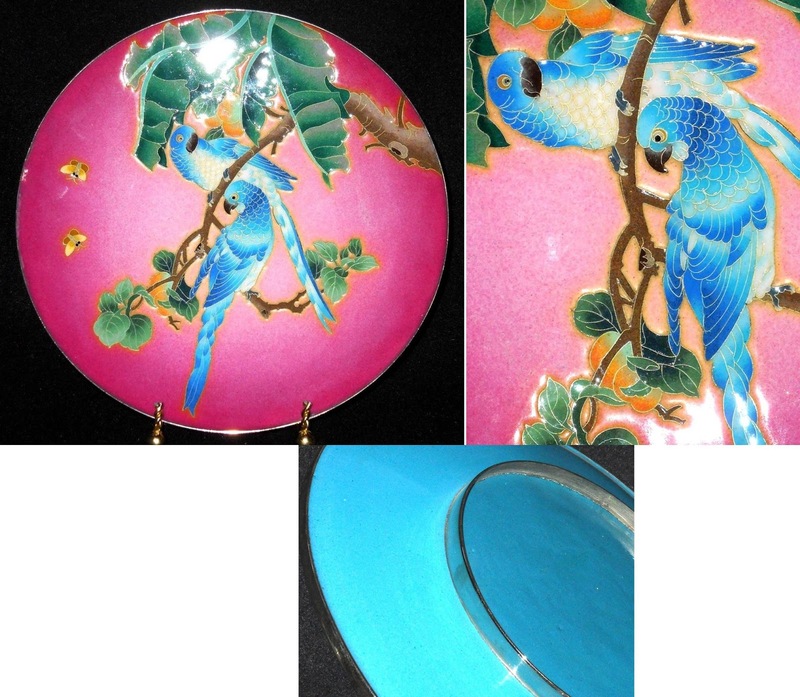 This plate with the parrots and fruit tree branch also appears with a bright lime green background. The wires seem to be silver. The motif seems Chinese. I don't know where or when these plates were produced - 1990s or later? What to make of all this puzzling evidence? Comments, anyone? Pictures would be great, thank you.